We are talking about word clouds. Not that other cloud thingy where old instagrams go to moulder in cyberspace. Remember that survey I put up? Well there was only one person who did it that was not family, friend or work colleague (thanks Mike). 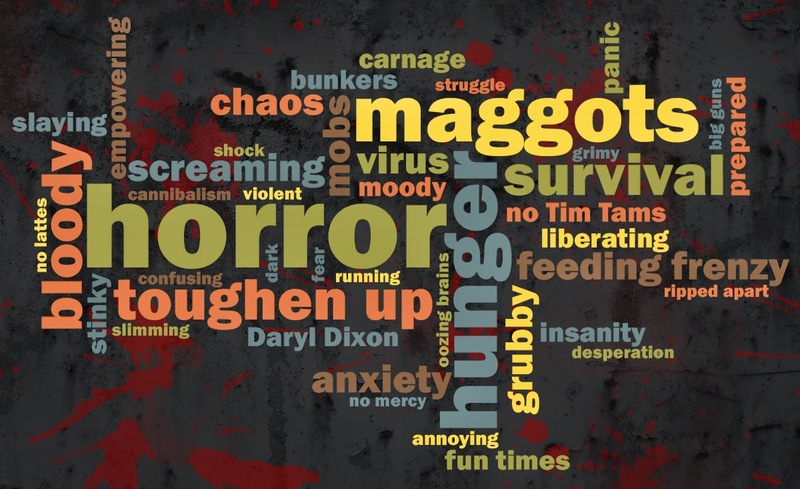 The low response rate meant I had to do a bit of fiddling with the data but I got enough to do a zombie apocalypse word cloud. If you have never seen one, the bigger the word the more it resonates emotionally with people. Not surprising most people associate "horror" with the zombie apocalypse. Followed by "maggots" and "hunger" and so on. Interestingly, lack of Tim Tams rated higher than being ripped apart. People know their priorities. What does it mean? No bloody idea but it looks cool and all creative. Next up is creating a mood board for the zombie apocalypse. Interior decorating will never be the same again. Bite off more horror than you can chew.